Project Paperback … IS DONE! | Home of the Thurian Saga Books! Project Paperback … IS DONE! Project Paperback … IS DONE! 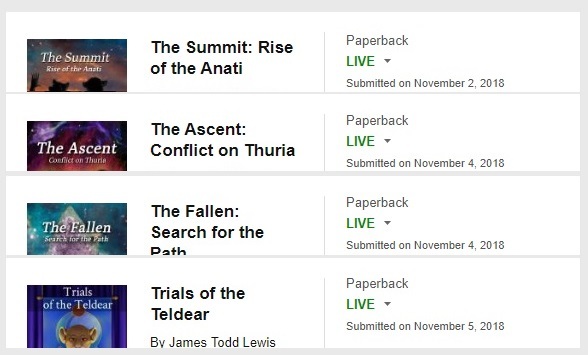 On September 19th (48 days ago), I started a project to take four of my titles that didn’t have paperback versions and add make them available for sale. Now, both the new paperback versions and their Kindle eBook cousins have undergone upgrades and other revisions. Everything from removing ellipses (…) to fixing minor grammatical errors to edits provided by Nathan Edwards and others helped to improve what was already out there! The art and covers got a refresh, also! I hope you enjoy! Now, I have also updated Ascension with edits, as well (both versions). However (and with my apologies), Amazon changed policy and made updates impossible for previous purchasers. When I asked, they told me it was something about complaints across their entire store about readers’ notes being wiped out. I can understand that, I suppose, depending on how many notes someone made. I’m curious to know the circumstances by which someone needs to make that many notes, but I’m supposing that Kindle versions of textbooks would be a fair example. More writing! I intentionally took a long time working on the administrative and production aspects of this hobby to give me time to get a fresh perspective. I’m feeling pretty good about that, now, and am looking forward to getting started on Enemy Deity. I think there is going to be a lot of interesting places to go and things to learn. Every book is a voyage, a journey for the author and the reader. The author cuts a path for the reader through a world and a time, inviting them to see all they can see. I’m looking forward to that work once again! Thanks for being along for the journey, and see you in the future! This entry was posted in Author's Comments, Writing Process, Writing Updates. Bookmark the permalink.